Many people think that to start a travel blog is hard; the truth is that it’s not that hard at all. If I can do it, I am sure anyone can. But you do need a few tools to get started such as a domain name, hosting, contentment management system, themes, plugins and some decent ideas. The great thing is that, you really don’t need to be trotting around the globe all the time. Mind you it does help if you are travelling and penning your travels in the form of blog posts and pictures. But even if you aren’t travelling but living in a country or city that has places of interest, you could be showing them to the world. What you need is domain name, hosting and content management system like Blogger or WordPress. First, you need a domain name for example ShaluSharma.com is my domain name. The best thing is to register a name that is easy to remember. Another great tip is to register that can be branded. You can register a domain name with any registrar that registers domain names. The best place to buy domain names is NameCheap. This is where I have bought all my domain names till date. Another one is Godaddy but NameCheap is my preferred choice. One of the good things about NameCheap is that they give you a year’s worth of free WhoisGuard protection. This means that your real address is hidden and their address is used. This helps if you are worried about spam and you don’t want anyone finding out your address. Registering a domain name is not so hard, although you will need to think of a domain name that you think will fit with your travel blog. Then head over the search box on Namecheap and register a domain name. The next thing you need is web hosting. It is the web hosting companies that gives you the internet hosting service allowing your website accessible through the World Wide Web. Now there are a multiple hosting providers that you can get your hosting from. I have bough mine from Hostgator. They say that they are the world’s besting hosting providers. They are right in many ways, they do provide cheap hosting and they are quite good if you have issues with your websites. I suggest you take a look at them. They have various webhosting plans from that include a Hatchling Plan, a Baby Plan and a Business Plan. The best ones are the Hatchling Plan if you are going to be hosting 1 site or the Baby Plan if you want to host multiple sites. The one I have is the Baby Plan. The great thing about Hostgator is that they have cpanel that allows you to install WordPress with a click of a few buttons using Fantastico De Luxe. Another hosting provider is the WP Engine. As the name suggest, it specialises in hosting WordPress sites. The most professional WordPress sites are hosted on it. They have multiple plans from personal to premium. Great thing about this hosting provider is that your sites are backed up daily automatically and you can restore them with a few clicks as part of your hosting plan. I think this is a great feature because the last thing you want is your site to disappear. They are offering 60 days of free hosting. They are currently offering 20 months free – PRE-PAY FOR WP ENGINE HOSTING FOR 1 YEAR AND GET 2 MONTHS FREE!. Bluehost is another hosting provider that is very reputable. Good thing about Bluehost is that it gives you a free domain name if you buy hosting from them. They are very good as far as shared hosting is concerned and if I had not bought my hosting from Hostgator then I would have bought mine from Bluehost. In fact, there is a debate on the blogosphere about which is better between the two hosting providers. CLICK HERE TO SIGNUP FOR BLUEHOST.COM. My current recommended choice would be Bluehost.CLICK HERE TO SIGNUP FOR BLUEHOST.COM. Once you have set up your WordPress on your domain name using cpanel, you are now ready to start using your site. Once set up, you will need themes and plugins. There are a range of free themes to choose from and many of them are good quality but if want to look professional, its best to buy premium themes. Some of the best WordPress these are from StudioPress.com and DIY Themes and the amazing themes they have. 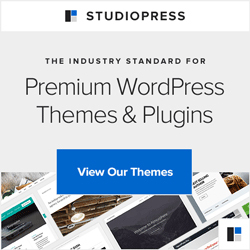 See some of the StudioPress Themes for WordPress. They happen to be the top 10 selling themes. In fact, they have absolutely the best WordPress themes around. Check them out see for yourself. The advantages of using the Genesis Framework by Studiopress include the decent price, good support, availability of information and the disadvantages are very few in my opinion. Many top bloggers are using their themes and even swear by it. 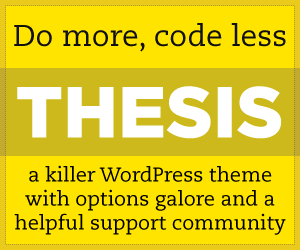 The Thesis Theme for WordPress are the developers of Thesis. It’s been marketed on the grounds that it would make creating fabulous WordPress sites easy and I agree with them. I have seen a lot of WordPress sites on my blogging journey and I agree with them. Their themes are exception. You will need to get traffic to your site. This is where most of the blogs fail. If there is no traffic to the site then this means that no one’s reading your blog posts. Think about it, if you buy a new phone, who’s going to call you until you have given out the phone number to everyone. Similarly, you will need to let the whole world about your new travel blog. You will need to use all the tricks of the trade to get visitors to your site who leave comments and engage with you. You will also need to leverage the power of social media to your advantage. Social media today is bigger than you think and if you are not using it, then you don’t really exist on the web. Here’s some of my social media account; Twitter, Pinterest, LinkedIn, G+ and Facebook. I use them to attract traffic to my website every single day. You will need to write blog posts that generate interest, something that creates a buzz and gets people to share them on social media. You can check my own blog to find out what kind of blog posts generate likes, shares and attract comments. Finally, and the most important part, you will need to make money from your blog. Unless you are travel blogging for a hobby then you don’t need to go any further. But you need to make money at at least get your hosting and domain name fees back. But if you want to make serious money from your travel blog, then you need to put in a bit of effort. There’s a range of things you can do from affiliate marketing to using contextual ads to writing ebooks and selling them on Amazon. Here’s my Amazon author page. There is no doubt that there is a bit of a learning curve. Even if you get a blog up and running, there is a lot of things you will need to do to make it really work and make money from it. I have therefore compiled an ebook on how to do this from start to finish. I have described everything you wanted to know on how to start a travel blog and make money from it. You can buy my, “How to start a travel blog and make money” ebook on all Amazon stores. Finally, if you want me to set up your blog, I can do that too for small fee of course. Why not look at some of my services. Feel free to contact me if you for any of my services. I don’t charge an arm and a leg. If you do buy my book then I can even waive some of the fees for you. When your blog is up and running, feel free to send me an email and I will visit your blog and offer you my blogging tips.